Objectives & Background Emergency cricothyrotomy is a common feature in all difficult airway algorithms. It is the final step following failed attempts to oxygenate a patient. It is rarely performed and has a significant failure rate. 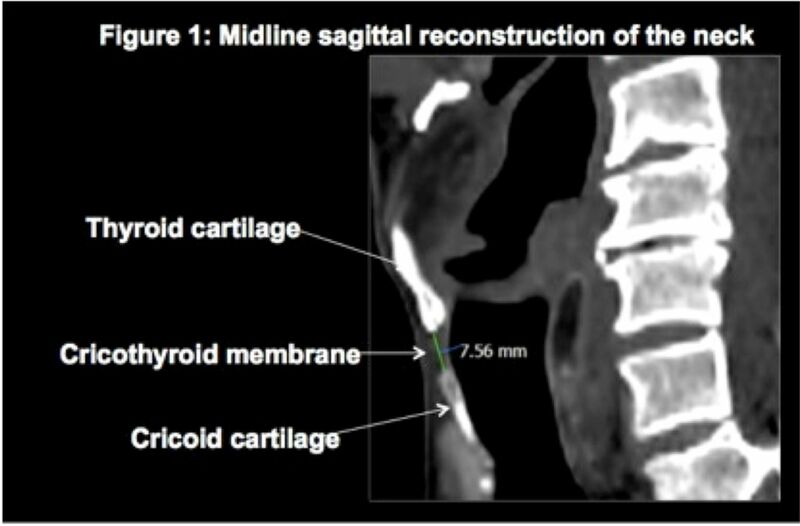 The size of the cricothyroid membrane (CTM) has been previously reported in the literature. There is variation in the reported size of this membrane, especially across population groups. Procedure failure may result from a discrepancy between the size of the equipment used and the size of the CTM. Methods An initial sample of 61 trauma CT scans were reviewed by two radiologists independently. Electronic calipers were used to measure the maximum height of the CTM. This sample was used to power further data collection by assuming a 5% level of significance with 95% confidence interval and precision of 0.2 mm–further scans were reviewed until a sample size of 478 patients was achieved. Results The median height reported was 5.85 mm (female) and 7.65 mm (male). These dimensions are much smaller than previously reported in the literature for Western patients. The external diameters of commonly used tubes used to pass through the CTM were compared with these measurements.